Have friends coming over tonight? Prepare these chicken wings – and watch them disappear. Preheat oven to 200 °C and line a baking tray with foil. 1. Marinade: In a large bowl combine all the ingredients. Add the chicken wings, toss through to coat with the sauce and allow to marinate overnight or for 30 minutes. 2. Remove the chicken from the marinade and place on the prepared tray. Place in the oven and bake for 20 minutes or until sticky, basting regularly while turning the chicken. 3. Dip: Combine all the ingredients and mix well. 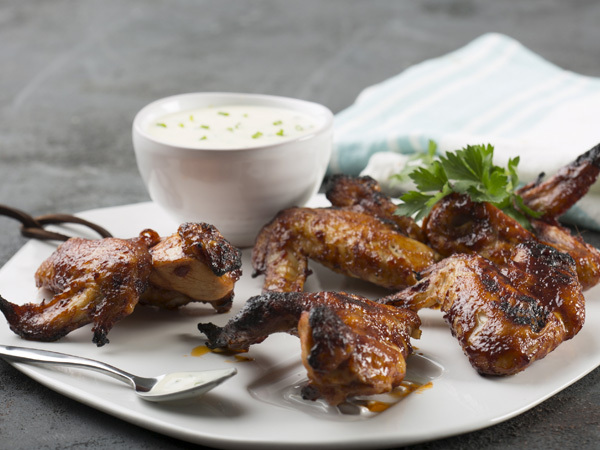 When the chicken wings are cooked, remove from the oven and serve with the dip.